After a bruising winter it’s time to go to a town that celebrates brightly colored flowers with dancing, art, music and windmill-ground flour. No passport needed. It’s Holland, MI where everything Dutch is celebrated year ’round but where when May comes tulips line the streets and the town is in festival mode. Plan now to visit because accommodations fill fast. Tulip Time is May 4 through May 12, 2019. Week days are less crowded but to catch the events you want, check the schedule. To see the schedule visit Tulip Time events. Dutch dances begin May 2, Tulip Town Tours, the artisan market and Art in Bloom, Tall ships, Tulip Time Quilt show are May 4. But many of these events continue through the festival. Tip: Don’t limit your time to just the main festival site. My favorite stop is Windmill Island Gardens on the edge of the downtown. It has a real, from-Holland, working Dutch windmill. There is also an antique children’s carousel and replica Dutch buildings. For Tulip time there is a Dutch Trade Fair and Dutch food. 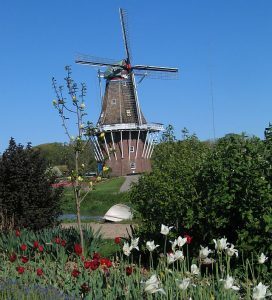 Next are two places on the outskirts of town near the highway that feature gardens and Dutch goods: Veldheer’s Tulip Gardens /DeKlomp Wooden Shoe & Delft Factory where you can watch shoes being made and delft painted, and Nelis’ Dutch Village Family Theme Park & Wooden Shoe Factory which is geared to kids. Accommodations I like the Courtyard by Marriott Holland Downtown and CityFlats Hotel that is also downtown. To see more choices visit Holland Hotels. Dining. I haven’t had a bad meal there. Among my faves are Alpenrose Restaurant and Curragh Irish Pub.But walkthe main street, 8th Street, and explore. There are lots of boutiques and good restaurants plus good sculptures to see and photograph. 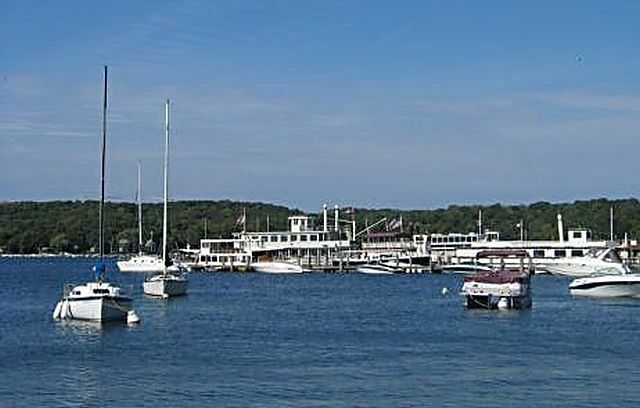 The best part of vacationing in Door County, WI is the way its delightful harbors make you feel you left work and daily stress miles back at the last stoplight. The county actually begins back a ways on a thumb shaped peninsula that separates Lake Michigan from Green Bay (the body of water, not the city). There are a smattering of stoplights at its southern end. But once you cross a drawbridge over Sturgeon Bay, a shipping waterway cut across the peninsula to connect Lake Michigan to Green Bay, you enter a world where a curve in the road reveals yet another scenic view and where villages have a few scattered stop signs, not stop lights. However, to experience the dangerous waters where Lake Michigan waves bump against those from Green Bay that give the peninsula its name, you should drive north about 40 miles from Sturgeon Bay to Gills Rock and then a short distance to Northport. There you would take a ferry across to Washington Island. Among the stories floating between the peninsula and the island is a tale of how when one native tribe lured another tribe to cross from Washington Island to the peninsula, those who attempted the crossing died in the stormy waters, thus giving the crossing the name Death’s Door. Safe? Yes, though sometimes the trip can be rocky. 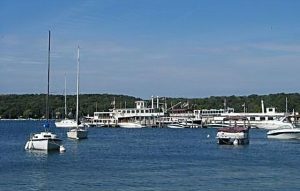 But the Washington Island Ferry is so popular the best plan is to check the season’s schedule and get to its departure ramp at Northport ahead of time so there is room for your car. While exploring look for Island Stavkirke, a recreated 12th century Norwegian church and the Jacobsen Museum of island artifacts. 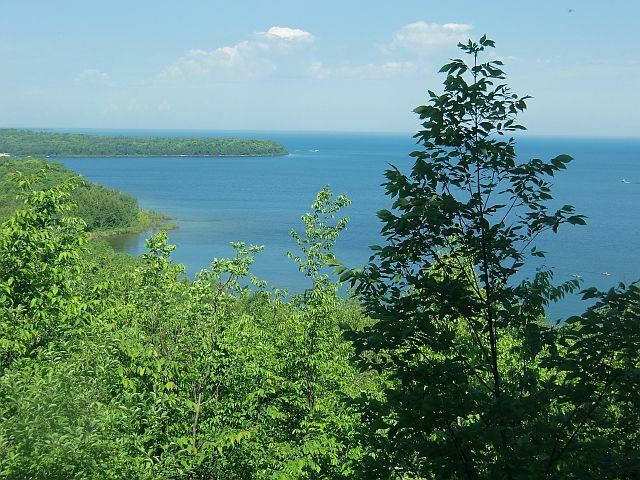 OK, you’re here, meaning at the Door County room, condo, guest house or cottage or other lodging you booked ahead of time, and you are already gazing out at the quiet blue expanse of Green Bay or the ever changing colors of Lake Michigan. When “The world is too much with us… late and soon, as English poet William Wordsworth said with a poem that continues with “we are out of tune” you know it is time to take a break. A good place to get back in tune is to plan a girls’ getaway where the view out the balcony door stretches across water and hills, where stress is forgotten over cocktails and delicious food and tension is massaged away by experienced hands. 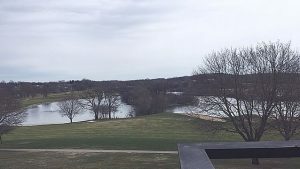 My sister and I found such a place when we chose Grand Geneva Resort and Spa in Lake Geneva, WI for our annual spa getaway. This year, my sister flew into O’Hare from Dallas so we could drive from my home in a northern suburb of Chicago. It took about an hour which is the same amount of time for someone flying into Milwaukee’s airport. The resort is just on the eastern outskirts of Lake Geneva so we first parked downtown for a bit of boutique shopping then headed to the Grand Geneva to unpack and unwind. FYI, the lake is called Geneva Lake and the town is Lake Geneva. The resort has lots of accommodation options ranging from deluxe rooms and suites to condos. We loved our deluxe double on the third floor of Building 3 with a view of a lake on the property. BTW Grand Geneva has 1,300 acres that include ski hills in winter turned into an adventure spot in summer, golf, horseback riding and plenty of paths to hike and bike. I liked the lap pool in the spa and fitness facility across the lane from our building. My sister liked the fitness center where she could work out with the type of equipment she used back home. While waiting for our spa services in the women’s locker room, we heard happy chatter from girlfriends enjoying the spa’s whirlpool. Another waiting area open to males and females, was a quiet relaxation space with good fruit juice, crackers and cheeses. We booked massages for one day and mani-pedi services, the next. Definitely recommend both. The resort had two top notch dinner restaurants, the Geneva Chop House and Ristorante Brissago. Both have good food and good service. The night we ate at the resort we were in the mood for Italian flavors and loved our choices of a pumpkin bisque, Osso Bucco and eggplant parmigiano. 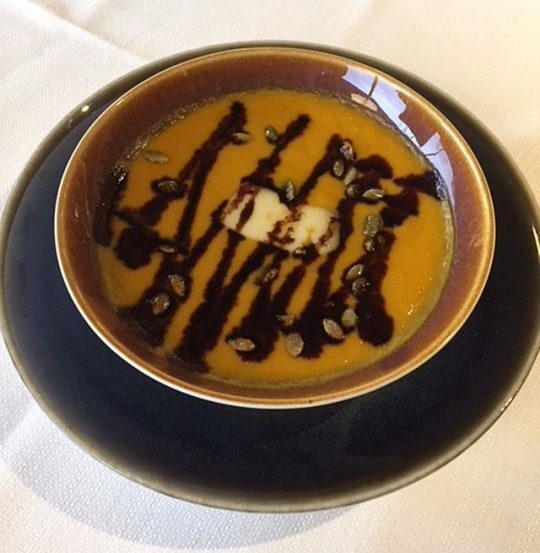 Pumpkin bisque that is sweet and savory with the added balsamic. The resort’s Sunday morning brunch in its Grand Café was tempting but after a weekend of eating we ordered light breakfasts from the menu. We left on Sunday but heard there was a shuttle that went into Lake Geneva on Monday for a tour of the town that included lunch. Maybe will do it next time. I’m thinking the resort would be a good place to visit next Valentine’s Day or birthday or anniversary or Mother’s Day. But regarding our experience, best of all was that everyone at Grand Geneva seemed to really care about the guests. For reservations and more information visit Grand Geneva. 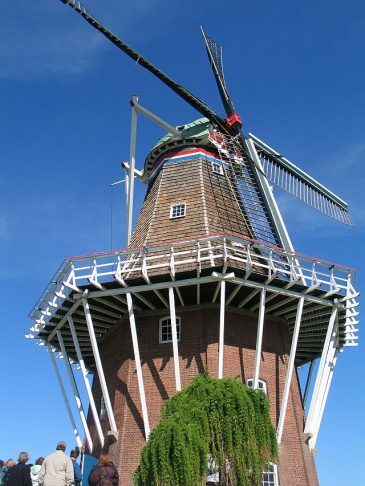 Less than three hours north of Chicago there is an authentic windmill that grinds out flour. Surrounded by gardens, small waterways and bridges, it is on Windmill Island and open spring, summer and fall. 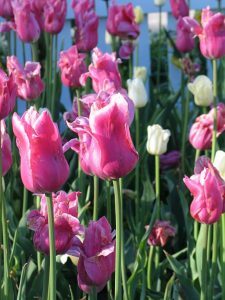 But a great time to visit is the second week in May when tulips are blooming across the island and its town, Holland, MI. 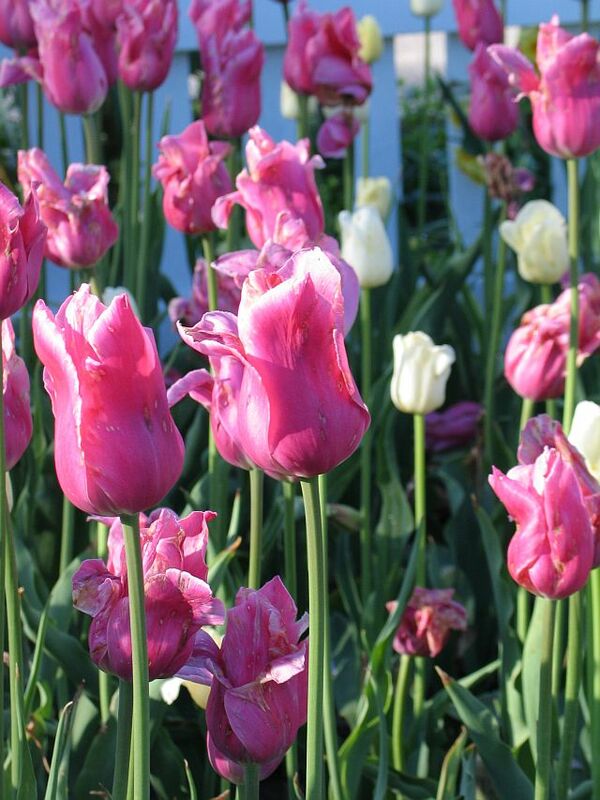 The whole town celebrates the blooms and its Dutch heritage with dances, art and craft fairs, parades and food during its famed, annual Tulip Festival. In 2018, it is May 5-13 but don’t worry if you can’t make it or find accommodations during the festival. 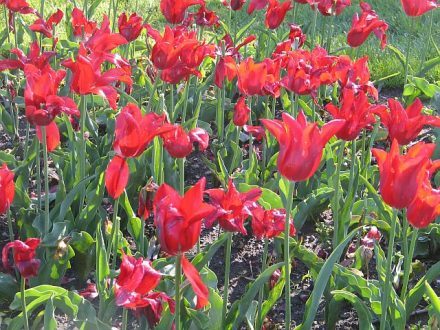 According to the Veldheer Tulip Farm and Gardens, a company that grows and ships bulbs globally, the tulips should peak the third week of May. No matter when going, Windmill Island is a must see. The windmill really is from the Netherlands. Dismantled and put back together there, it is run by a licensed operator who grinds flour that can be purchased and used at home. The island also features, a Children’s Carousel, a street organ, a couple of delightful buildings with Dutch figures and gifts and there are good walking paths. But also visit the downtown for its good food, beer and boutiques. Stop in at Austrian Alpen Rose for breakfast, lunch or a coffee and pastry break. 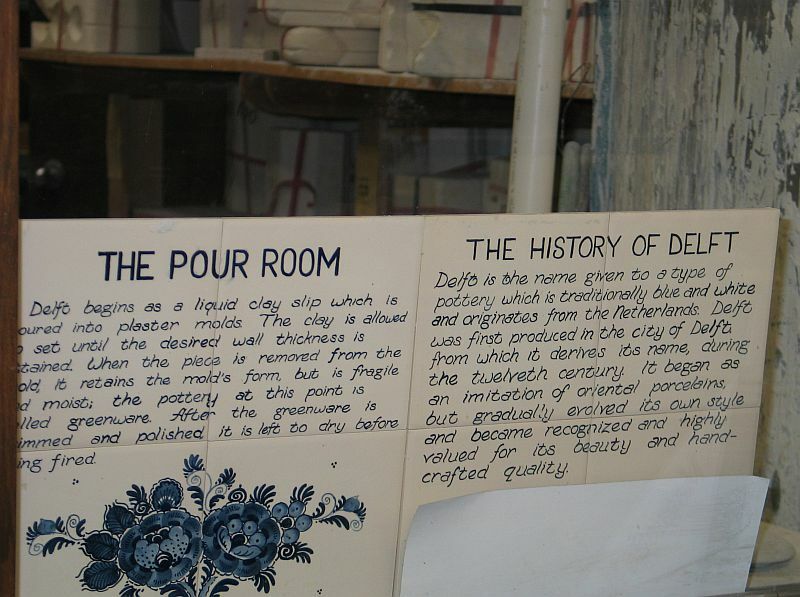 Save time to see wooden shoes made and delftware painted on the outskirts of town at the DeKlomp Delftware and Wooden Shoe Factory on Quincy Street. Entry is free but you’ll want to take home well-made gifts for yourself, family and friends. BTW De Klomp is Dutch for wooden shoes. 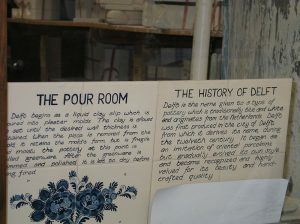 Learn about Delftware and watch it being painted. Another place is Nelis’ Dutch Village that features dancing, shoes, Delftware and playground activities. Entry has a fee because it is an entertainment area. 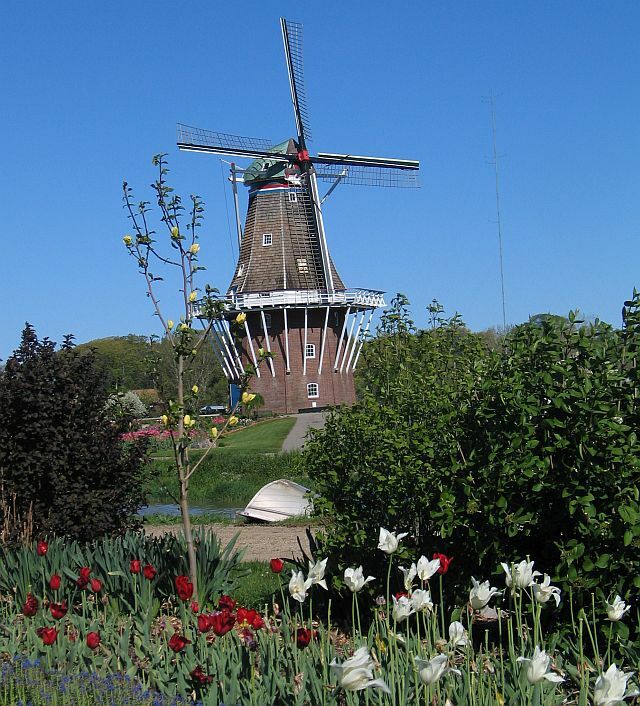 Room availability is scarce during the Tulip Festival so make plans ahead of time, then go enjoy the Dutch culture of a Holland that is here in the States.